Valerie Moody is a courageous and determined lady from Co Donegal. Valerie has had ME for thirty years - the last nine years bedbound. Despite this Valerie believes it is still important to use what we have got and try to bring about change and, like us, she believes that if we want to bring about change then we have to do it ourselves. Valerie has helped IiME in the past and contributed to the costs of the CAWG meeting last year in London . This made it possible for IiME to even attempt to achieve this in collaboration with the Alison Hunter Memorial Foundation of Australia. on 22nd JUNE 2013 at her home Momeen St Johnston, Co Donegal . between 2pm and 5pm. 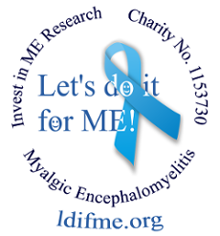 As she has done previously all funds raised in Sterling will be given to Invest in ME and in Euros to Tom Kindlon's Irish ME/CFS Association. The event is in a number of parts. The opening is being performed by a government official. Minister Dinny McGinley TD has agreed to come and open the event and he has even rescheduled governmental overseas meetings so that he would be able to attend. Minister McGinley came to Valerie's home almost two years ago to launch her book and it is impressive that there now exists a continued representation especially in government. There will also be a coffee afternoon and music. Valerie will also hold an ME Information corner and intends to put up on a wall all the stories which have been collected so that other people could read them and, in a more personal way, identify with us are real people with a real illness. It will be an opportunity for the community to get together and enjoy each others' company to see and bring about awareness of ME. The idea would be to get as many "important" people as possible to come and get photos. So Valerie is contacting ME support groups to see if they could send a representative to be there with him. It would be a good opportunity to impact and use our voices together so that people see that there are other people with the illness and that we are trying to help ourselves - and Minister McGinley is an official in the Irish Government and "although one man cannot change policy we can plant the seed for change". Valerie has asked IiME to encourage as many ME sufferers as possible to send her their personal story plus photo as she believes it is an important way to use our collective voice. This would also allow others to know that people with ME are not isolated to one area - that it is global problem. IiME are happy to collate these stories, print them and send them to Valerie to avoid her doing more work than is necessary as this would be easier for her and the items would be ready to pin up. IiME will be sending material to Valerie for display and distribution - along with any stories we can pass on. These stories may not get much publicity but Valerie believes that we can still plant the seed and when ME does come up at governmental level in the future there will be someone with an awareness of the effects of ME and will hopefully be on our side. By so doing the general public will be able to identify with our plight in a more personal way and be able to see that people with ME are real people with a real illness and had lives before ME devastated them. If you would like to contribute to this with your story then please send in, via email if you wish, your story with a photograph. We will print these and/or send them to Valerie. The venue for the event is at Valerie's home - a farm. Valerie had 300 to 400 hundred people at her house for tea at the last book launch that she performed and she is hoping that there will be a good attendance this time. She is hiring a marquee for the tea and music this year. Valerie explains that even if we educate the people that come to the venue it is still raising awareness and that perhaps when people do take ME they will at least be treated with respect and dignity by the people around them and that they will not always have to defend themselves against misperceptions and misinformation while waiting for a cure.